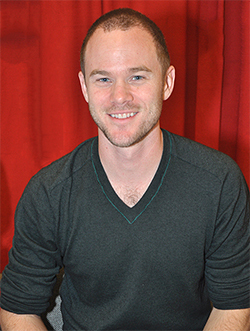 Aaron Ashmore was best known for playing Marc Hall in the 2004 Canadian TV movie Prom Queen: The Marc Hall Story. Since then, he has appeared in the films Safe, A Separate Peace, and A Bear Named Winnie. He has also had guest roles on television shows such as The Eleventh Hour, The West Wing, and 1-800-Missing. Ashmore played the recurring role of Troy Vandegraff on The WB television series Veronica Mars, and is currently playing the role of Agent Steve Jinks on the Syfy show Warehouse 13. He was cast as Jimmy Olsen, first love interest of Chloe Sullivan, for the sixth season of Smallville on the WB television network and continued to play him into its eighth season. Two years after leaving the show, Ashmore returns to play his character's younger brother on the series finale. Coincidentally, his friend Sam Huntington played Olsen in Superman Returns and the two have both appeared in Veronica Mars. Ashmore's twin brother appeared on Smallville in earlier seasons. Besides his recurring role on Smallville, Ashmore had roles in the 2007 films Palo Alto, Privileged, The Stone Angel, and The Christmas Cottage. Aaron is currently filming Fear Island, a horror film also starring Haylie Duff in Vancouver. MTV.ca announced on October 6, 2010, that he will have a role in Maple Pictures comedy film Servitude, which stars Joe Dinicol, Lauren Collins, Linda Kash, and John Bregar.